I caught an episode of Motion, "a daily outdoor exercise and activity program," on TV Sunday. Apparently Motion is a syndicated show where the host and guests hike through national parks and other scenic places. This episode featured Canyonlands National Park in Utah. The centerpiece was a stop at False Kiva, an "Anasazi" site in the park. 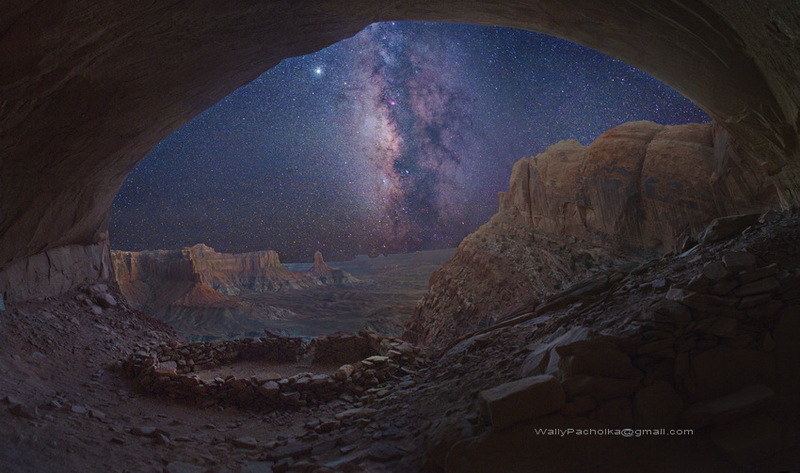 And the Wikipedia entry for False Kiva:False Kiva is a human-made stone circle of unknown origin in a cave in a remote area of the Canyonlands National Park, which is located in U.S. state of Utah. It requires some hiking knowledge or special directions to find. Host Greg Aiello doesn't reveal the location, but emphasizes that you can find it by asking or investigating. Aiello uses the term "Anasazi," which is politically incorrect but still commonplace. The preferred term is "Ancestral Puebloan." Aiello says photographers may have built up the structure to make it more photogenic, which would be lame if true. Aiello doesn't offer much Indian lore, but does say the Anasazi eventually moved away. That's a refreshing change from the sources that say they "mysteriously disappeared." If the region was hit by drought, the most common theory, of course the people moved away. They didn't just shrivel up and die because they were too primitive to think of a solution. For more on the Anasazi, see Indians in Ace in the Hole and 2010 Christmas Pix.